We wanted to use our Dutch oven to bring this versatile vegetable to its full potential without all the extra work. 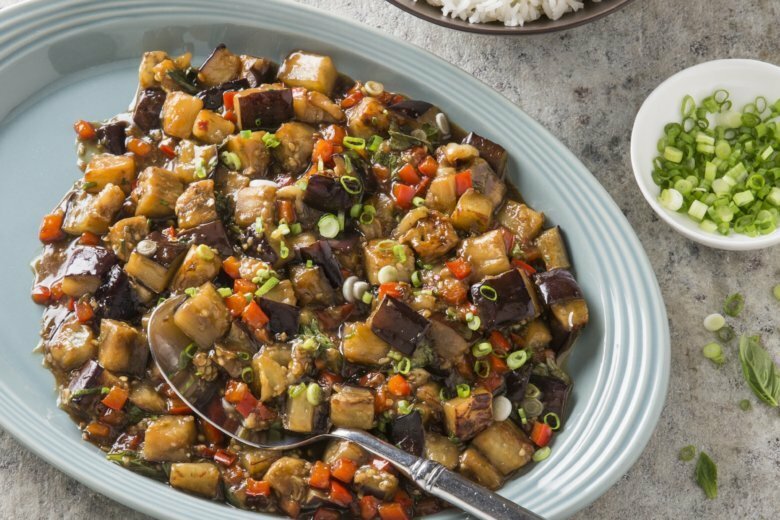 By cutting the eggplant into cubes and cooking it in two batches, we found we could take advantage of the Dutch oven’s heat to drive away moisture and brown the eggplant at the same time. To complement its earthy flavor, we also added sweet red bell peppers to the pot, along with a generous dose of aromatic garlic and ginger. A bold Thai-style sauce, flavored with potent ingredients like fish sauce, brown sugar, lime, and red pepper flakes, completed the dish. Basil and scallions added freshness and a pop of color. Do not peel the eggplant; leaving the skin on helps it hold together during cooking. For the sauce: Whisk all ingredients together in bowl. For the vegetables: Combine 1 tablespoon oil, garlic and ginger in bowl; set aside. Heat 3 tablespoons oil in Dutch oven over medium-high heat until shimmering. Add half of eggplant and half of bell peppers and cook, stirring often and scraping bottom of pan to loosen any browned bits, until tender, about 12 minutes; transfer to separate bowl. Repeat with remaining 3 tablespoons oil, eggplant and bell pepper; transfer to bowl. Scrape away any remaining browned bits from now-empty pot. Return cooked vegetables to pot and push to sides. Add garlic mixture to center and cook over medium-high heat until fragrant, about 1 minute. Stir garlic mixture into vegetables. Whisk sauce to recombine, then add to pot. Cook, stirring constantly, until sauce is thickened, about 1 minute. Off heat, stir in basil and scallions. Serve. Nutrition information per serving: 261 calories; 145 calories from fat; 16 g fat (1 g saturated; 0 g trans fats); 0 mg cholesterol; 1268 mg sodium; 28 g carbohydrate; 6 g fiber; 17 g sugar; 4 g protein.